The Puerto Rican promoting the assembly of a monumental statue of Columbus, as tall as New York’s Statue of Liberty and taller than any other in the Americas, wants Spain’s king and queen to inaugurate the monument in the spring of 2016, the Spanish news agency EFE reports. Entrepreneur Jose Gonzalez Freire told Efe Tuesday in an interview that his goal is to take advantage of the Spanish royals’ possible visit to the Caribbean island for the 7th International Congress of the Spanish Language, also scheduled for the spring of 2016. “We believe construction will be completed between late 2015 and early 2016, which gave us the idea that the king and queen could take part in the ribbon-cutting ceremony,” said the entrepreneur, owner of the food company Pan American Grain, one of Puerto Rico’s largest concerns. Completed in 1991, its Russian creator Zurab Tsereteli tried to install the mega-statue a year later in the United States, but local authorities denied him the necessary permits. The municipality of Cataño near the Puerto Rican capital accepted it, but due to a lack of funds and indifferent public support, an attempt was made to shift its venue to Mayaguez on the extreme western end of the island. Gonzalez Freire finally took over and decided to install the 295-foot (90-meter), 600-ton (544,000-kilo) sculpture on his own land in the town of Arecibo on Puerto Rico’s Atlantic coast, beside one of his beautiful beaches. When assembly began last April, the architect in charge of the project, Roberto Alcina, told Efe that the process is as complex as building a 30-story building. The first 20 meters (66 feet) of the statue’s height is made of reinforced concrete sheathed in steel. To the figure’s total height of 90 meters (295 feet) must be added another 20 (66) for the knoll on which it stands, plus another meter (3 feet) for its pedestal. 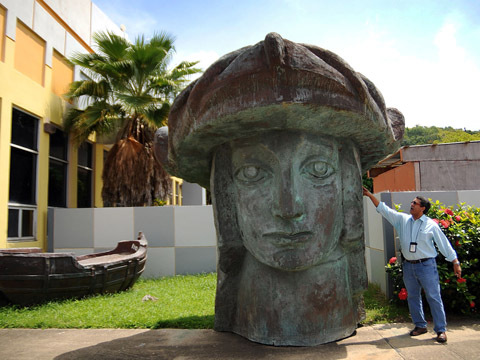 For the promoter, the idea of erecting the statue of Columbus on Puerto Rican territory is a way of celebrating the discovery of the New World. Those leading the campaign contend that “for the indigenous peoples of the Americas, Columbus is a symbol of genocide” and is definitely not a hero.